Let us examine a unique aspect of the genealogy of our Lord Jesus Christ in the Gospel according to St. Matthew: the inclusion of several women. The historical reality is that, in Biblical genealogies, women are not typically included. A person’s lineage was defined primarily by his or her male ancestors. But in Christ’s genealogy, we have several interesting women listed: Tamar is mentioned in v. 3, as are Rahab and Ruth in v. 5, as well as Bathsheba in v. 6 (she is not mentioned by name, but as “her who was the wife of Uriah”). The inclusion of these women breaks the common formula of “A begat B, B begat C” in the genealogy. If we consider the unusual inclusion of these women and ask ourselves why they were included in this genealogy of our Lord, we would arrive at several possible answers that have been offered throughout history. First, we might be able to say that all of these women were Gentiles. Rahab and Ruth were most certainly Gentiles. We read in Josh 2:1ff that Rahab, the famous harlot, was a pagan from Jericho, while in Ruth 1:4, Ruth is presented as a Moabite woman. It is not as clear, however, whether Tamar and Bathsheba were Gentiles. Tamar is described as the girl Judah took for his son Er in Gen 38:2, but we are not told from where Judah took her. It seems that she is a Canaanite from the text, a conclusion supported by the fact that Judah himself took a Canaanite wife, Shua, in the same chapter, but it is not confirmed one way or another in the Holy Scripture. We do not know about Bathsheba’s lineage, but one can speculate that she was probably a Hittite like her husband (2 Sa 11:3). In the final analysis, there is a good chance that all four of these women were Gentiles, but we can prove that only with two of them. Assuming they were included in the genealogy because they were Gentiles, St. Matthew’s message would be that Christ is calling the Gentiles — all the nations — to Himself, because He descended from both Jews and Gentiles. 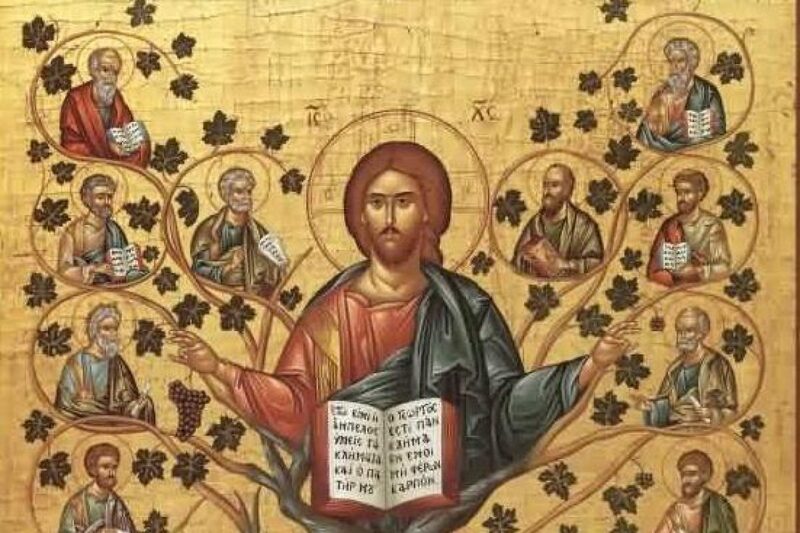 This message is repeated in the genealogy of our Lord found in Luke, which traces Christ’s lineage back to Adam, the universal ancestor of all mankind. Second, we might be able to say that most of these women are distinguished by some type of sinful activity. Tamar disguised herself as a harlot and conceived sons by her father-in-law, Judah (Ge 38). Rahab was a harlot in Jericho whose life was spared because she helped Joshua’s spies. Bathsheba was the wife of Uriah, David’s general, who committed adultery with David and became his wife when David arranged for Uriah to be killed. In these three women, we can identify specific sins, but this is not necessarily the case with Ruth, who was a gentle woman who nobly married into the Israelite people. “Therefore, in all things He had to be made like His brethren, that He might be a merciful and faithful High Priest in things pertaining to God, to make propitiation for the sins of the people” (Heb 2:16–17). Christ therefore took upon himself a blood relationship to that nature which fornicated, in order to purify it. He took on that very nature that was sick, in order to heal it. He took on that nature which fell, in order to lift it up. All this occurred in a charitable, beneficial manner wholly appropriate to God.2Thus, one of the ways we understand the inclusion of these women is that our Lord descended from them despite their sins to show us that He would redeem us from our sins. Now, it is not entirely accurate to say that these women were included in the genealogy because they committed sins, because that would limit their importance only to their sins. The redeeming feature of all of these women is that they loved Israel, the people of God. Tamar, who was most likely a Canaanite, was married to Er and Onan, the sons of Judah, whom God killed for their wickedness. Despite what happened, Tamar did not simply go and join herself to a local man, but rather, disguised herself as a harlot and conceived twin sons with Judah. So, once she was accepted into the people of Israel, she chose to remain. Hearing of the deeds of the children of Israel, she loved Israel more than her own people. And this fact seems to be doubly credible to me. Since Salmon was considered noble among the children of Israel and was of the tribe of Judah and the son of the prince, he saw the faithful Rahab thus converted to goodness and beloved by God and led from Jericho at God’s command and counted among the daughters of Israel. Such a wonderful woman surely deserved to become Salmon’s wife.3Rahab loved Israel and joined herself to the children of Israel, as well. She recognized the Lord’s power and demanded from the spies the promise that she and her family would be spared when the Israelites conquered Jericho (Jos 2:18–24). For this reason, she is remembered in the New Testament as a heroine of faith (Heb 11:31) who was justified by her works (Jas 2:25) after receiving the honor of being listed in the genealogy of Christ as the wife of Salmon and the mother of Boaz, the ancestor of David (Mt 1:5). Ruth was a Moabite woman who did the same thing through her husband’s family. She would eventually become the great-grandmother of David. Bathsheba clearly loved Israel, because she became the Queen of Israel as the wife of David, albeit through sin, and the Queen Mother as the mother of Solomon. We see, therefore, that all four of these women loved Israel and became God’s instruments in continuing the Messianic line. Therefore, we do not focus only on the fact that they were sinners, but also on their love for the people of God and what they contributed. Third and finally, we may be able to say that all of these women had irregular marriages. Tamar was married to Er, but God killed him for his wickedness. She was then given in a levirate marriage to his brother, Onan, so that Onan could raise children for his dead brother through her. Unfortunately, Onan had sexual relations with her, but emitted his seed on the ground. God despised his action and killed him for his wickedness. She then conceived sons with her father-in-law. Rahab worked as a harlot before Salmon married her. Ruth married Boaz in the most unusual circumstances. The same can be said for Bathsheba and David. If this was the purpose for their inclusion in Matthew’s genealogy, then we can say that St. Matthew was preparing us for yet another irregular couple at the end of his genealogy: St. Mary and St. Joseph. Each one of these women and their relationships, in their own distinctive way, prepare us for the irregular birth of our Lord Jesus Christ that will be taken up at the end of Matthew 1. We continue reading the genealogy of our Lord with the same traditional formula, “A begat B, B begat C”, which was in use since at least the time of Ruth. Then, suddenly, we encounter these four women who break this formula and tradition not only by their inclusion in the genealogy, but by their lives, actions, and relationships. It is almost as though St. Matthew is telling us to prepare ourselves for something even greater and more perplexing: the virgin birth of our Lord Jesus Christ. One Response to "The Women in the Genealogy of Christ"